This is a study of the Ten Commandments as found in the book of Exodus and re-capped in Deuteronomy. There is confusion among believers whether or not these instructions contained in the TaNaKh are still to be taken literally. I hope that the following study will open your eyes to look at the familiar words in a new (Renewed) way. 2 Cor 4 God has shown us such mercy that we do not lose courage as we do the work he has given us. 2 Indeed, we refuse to make use of shameful underhanded methods, employing deception or distorting God’s message. On the contrary, by making very clear what the truth is, we commend ourselves to everyone’s conscience in the sight of God. 3 So if indeed our Good News is veiled, it is veiled only to those in the process of being lost. 4 They do not come to trust because the god of the ‘olam hazeh has blinded their minds, in order to prevent them from seeing the light shining from the Good News about the glory of the Messiah, who is the image of God. 5 For what we are proclaiming is not ourselves, but the Messiah Yeshua as Lord, with ourselves as slaves for you because of Yeshua. 6 For it is the God who once said, “Let light shine out of darkness,” who has made his light shine in our hearts, the light of the knowledge of God’s glory shining in the face of the Messiah Yeshua. A couple of years ago, I was astonished and blessed to find peace when I began to see the Bible in a Hebraic, or Hebrew Roots, perspective. Long-held beliefs were challenged, and answers to questions I had held since a child were exposed and answered. It changed my life. I wish to thank Michael Rood for his faithfulness to deliver the faith once given to the saints to a world that sees not the error of their ways. Without the Jonah Code, I am not sure when I would have learned the Truth, and how to come to terms with what the prophet Jeremiah said: — O LORD, my strength and my fortress, and my refuge in the day of affliction, the Gentiles shall come to thee from the ends of the earth, and shall say, Surely our fathers have inherited lies, vanity, and [things] in which [there is] no profit. Jer 16:19. Many like-minded friends I have met had a much more profound reaction to learning the truth. [I don’t mean to imply I have all the answers, but that the course-correction of realizing the Torah is for ALL believers set me toward Truth.] Once I realized that He really hadn’t changed, but was the same now as He was when He created our world, everything came into focus. To me it was a great relief and I was happy and excited to learn more. Not to say this paradigm shift away from my life-long Christian traditions was totally without angst; but, discovering the Way of Truth was so much more satisfying! Others that I have met were horrified, saddened and angry to learn that they had inherited lies. These lies, rooted in paganism, are the basis for the Christian celebrations of Easter and Christmas and other traditions not found in the scriptures. Just painting a new label upon these festivals does nothing to sanctify them to our Creator. He provided us with an instruction book on how to worship Him and how to live in harmony with our neighbors. It is found in the Torah. I regret I did not learn it sooner, but I am humbled to have heard it at all. This paradigm shift was a bright light that illuminated what had been missing from my understanding for so long. I was relieved and excited to learn the truth and finally connect the dots! My biggest regret is that I passed along so many traditions based in lies to my sons. I failed to follow the commandment to “teach your children in the way they should go and they will not depart from it.” I didn’t teach it, because I didn’t understand it until long after they had grown up and left our home. Now, the legacy of what I did teach is a stumbling block between them and the Father. ZEAL OR TRUTH IN LOVE? I think some folks are too afraid to abandon where they are comfortable, and what they have inherited from their dear family, because it may seem like a betrayal of those they love. It seems like a rejection of good times, or perhaps even a betrayal of God (or at least their perception of Him)! It is radical to give up what we have always accepted as the gospel for the good news once delivered to the disciples; but, it is worth it! Given a choice between man and YeHoVaH, I wish not to betray my Father in Heaven; even when it overturns everything I learned in church or thought I knew before. Those who think the Old Testament has become obsolete or is based in myth or allegory, are not looking for concrete evidence of its truth. Somehow, we have come to view the Bible as a man-written chronology, or even mythology, to bolster a man-made faith. A casual look at the Bible might lead to that conclusion, but the more I study and recognize the intricate and profound weaving together of the Word of God, the more I recognize His hand in all. I have seen first-hand the evidence of His sovereignty! When we toured Israel, we wandered through the desolate ashes and barren ruins of Gomorrah collecting brimstone. We are told in the Bible these ruins would be an ‘ensample’ for us. I assure you they are real, and exactly as described in the written word. We serve a mighty and righteous GOD. His name is YHVH. The evidence of the accounts in the Old Testament continues to be discovered to this day! There is film footage of the coral-encrusted chariots at the bottom of the Red Sea. They have found the remains of Noah’s Ark. Ancient Hebrew Matthew texts have cleared up apparent discrepancies in the Biblical record and have clarified interpretations that missed the point in the New Testament. Almost daily there are new discoveries in the Holy Land that verify Biblical texts! We live in exciting times! 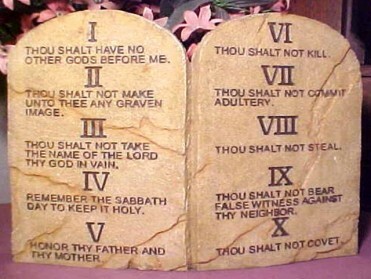 Where can we find the first mention of these ‘great’ commandments? Here they are! Leviticus 19:17 “You shall not hate your brother in your heart, but you shall reason frankly with your neighbor, lest you incur sin because of him. 18 You shall not take vengeance or bear a grudge against the sons of your own people, but you shall love your neighbor as yourself: I am the LORD. So, if all the Law and the Prophets ‘hang’ (i.e. are suspended from) the commandments to Love God and Love our Neighbor, then all of the commandments are guided by and embody: LOVE! Those in the first century would have been familiar with the Law of Moses, and they would have understood this summary of the commandments. BUT, I AM OF ABRAHAM, NOT MOSES! If we say that we are inheritors of the promises of our Creator because we are ‘children of the Abrahamic Covenant’ then we should understand Abraham. He was faithful. Did that mean he just believed in God, or he believed God? Abraham is known as the father of the faithful because “Abraham obeyed my voice, and kept my charge, my commandments, my statutes, and my laws,” Genesis 26:5. What statutes, commandments and laws would that be? Wasn’t Abraham a patriarch before Moses? Are we to understand that the instructions, later written down at Mt. Sinai, have been from the beginning? Didn’t Cain and Abel understand they were to bring sacrifices to the Father? Didn’t Noah understand the difference between ‘clean’ and ‘unclean’ animals? It would seem that the laws, statutes, and ordinances were not a new invention when they were given to Moses. YHVH is eternal, and so is His Law. What Moses received was a renewal of the original Torah. Wasn’t it? Are there clues? What does the 4th commandment say? It is about the Sabbath! The Sabbath day was declared holy from the first week of creation! So, at the very least, the 4th commandment is an ‘original.’ If that is true, then might we not deduce that all of them both pre-dated Mt. Sinai and continue beyond Moses as well? Yeshua never taught anything that is not found in the Torah. He never changed anything, or encouraged anyone to do so. If anything, when he explained the Law, he raised the bar of our awareness. He echoes the Old Testament which reads: “Do not lust in your heart for her beauty, and do not let her captivate you with her alluring eyes;” (Prov 6:25) when He says: “But I say unto you, That whosoever looks on a woman to lust after her has committed adultery with her already in his heart.” (Matt 5:28). He didn’t teach anything new, He just expanded our understanding of what was already written. The Proverbs verse gives the ‘letter’ of the Law, and Yeshua gave us the ‘heart’ or ‘spirit’ of the Law. This verse is used a lot to bolster an argument that Yeshua ‘fulfilled’ the Law, with the errant conclusion that since he ‘fulfilled’ it, we don’t have to. But what does ‘fulfill’ mean? Fulfill comes from the Greek word pleroo which means to ‘fully preach.’ See Strong’s G4137. The Hebrews who wrote the Bible understood Yeshua’s idiom of ‘destroy and fulfill.’ Someone who misinterpreted the law was said to ‘destroy’ the law. Those who ‘fulfilled’ it were those who taught it with accuracy and complete understanding. ‘Fulfilling the law’ then is teaching how to understand the ‘spirit of the law,’ which is exactly what Yeshua was doing! He was clearing up misunderstandings, removing religious doctrine that corrupted His instructions, and helping get people back on the right path! HOW DID WE GET ON THE WRONG PATH? Since many of the things understood from the doctrines learned in church seem to be inaccurate, or at least not ‘fully preached,’ let’s investigate the Word from a Hebraic perspective. Let us use a First Century lens and embrace the Father’s Hebrew language in order to better understand the spirit of the Law. We need to find harmony in the written Word! Harmony between the Scriptures and the Word that became flesh and dwelled among us (John 1:1)! We need to reconcile how the Old Testament relates to the New Testament (Or to be more accurate: vice versa). In simple terms, the instructions (Torah) that were written by the inspiration of YHVH allow us to ‘correct our course’ and ‘receive instruction in righteous behavior,’ so that we may DO those ‘good works.’ The verse says Scripture is given so that the man of God might be perfect! Huh? Again: if the law is perfect, and it can make a man perfect, then how is it beneficial to remove anything from what is perfect? Wouldn’t that make it impossible to meet the perfect standard He gave us? It should go without saying that 2 Timothy refers to the Old Testament writings. The epistles of the New Testament were not ‘printed’ until the latter part of the first century. The Old Testament is our primer and dictionary for what is later assembled and called the ‘New Testament.’ They are all inspired, and they are all in agreement! It occurred to me that just as Yeshua encapsulated all the Law into the brief statement to Love God and Love your neighbor; the Ten Commandments are similarly edited to simple statements that are actually a lot more complex than we first think. What if looking at them in a Hebraic perspective could get to the ‘heart’ of the matter? What if we connected each commandment to the first ten letters of the Hebrew Aleph-Bet? Would that expand our understanding of what YHVH meant when He wrote the commandments on the stone tablets that He handed to Moses? What if we employed a similar rubric to the Ten Commandments? Let’s associate the first ten letters of the Hebrew Aleph-Bet to the Commandments. It may surprise you to see how the Father has perfectly positioned every word of the Scripture. Everything makes sense and exhibits the Hand of the Great Designer! Hebrew scholars believe there are four levels of interpretation for scripture: Literal, Hint, Search and Hidden. How do we mine down to find the hidden bits? You may be surprised how much can be gleaned when the Aleph-Bet is ‘attached’ to the commandments. It is a bit like using a different lens with which to view the Commandments. They are not changed, but enhanced by the different perspective. DO NOT ADD OR TAKE AWAY FROM THE COMMANDMENTS! Before I go on, I want to clarify that this isn’t to ‘add to’ or ‘diminish from’ what He gave us, but to discuss how we might expand our understanding. Just as ‘Love God and Love your Neighbor’ simplifies and illuminates the concepts found in the Law and the Prophets; so may the Ten Commandments be a simplification of the Law for YHVH’s people. Yes, so relevant for US today! I happened upon this website by accident. Looking online for images to inspire my work on two tables of slate I aquired. Deciding whether to engrave the Ten Commandments in Hebrew or English. Very encouraging to read others who truly love the truth in full form. I’ve began again from the beginning, and now in Numbers. I’m finding the more I read these historical examples, the more I appreciate the light of Christ that shines from the shadows, to the hope ahead. The words of comfort bring encouragement. The harsh reads bring conviction and motivation to move onto the fullness of Christ in complete surrender. Love the Old and the New. Great article Kenny….I’m looking forward to Part 2 !!???? Shalom and Happy New Year !!!???? Yep, I agree, great article Julia! I have friends at Beth Hallel that are into the Hebrew letters for studying the Word, and I don’t think that is “adding to” at all, it is finding the depth of Father’s Word!